Mice infestations are on the increase in the Macclesfield area, therefore pest control is needed more than ever to help you get rid of a mouse problem. They can be a health hazard as they carry the salmonella bacteria that can be passed on to people through food or food surfaces that they contaminate. Removal of this problem is something we at Town & Country Pest Control can deal with professionally, swiftly and at an affordable cost. House mice usually run, walk, or stand on all fours, but when eating, fighting, or orienting themselves, they stand only on the hind legs, supported by the tail. When they run, the horizontal tail serves for balance; the end stands up vertically, unless the mouse is frightened. Mice are good jumpers, climbers, and swimmers. Mice are mostly active during dusk or night; they do not like bright lights. They live in a wide variety of hidden places that are near food sources and construct nests from various soft materials. Mice are territorial, and one dominant male usually lives together with several females and young. Dominant males respect each other's territory and normally enter another's territory only if it is vacant. If two or more males are held together in a cage, they will often turn aggressive unless they have been raised together from birth. House mice primarily feed on plant matter but are omnivorous. They will eat their droppings to acquire nutrients produced by bacteria in their intestines. House mice, like most other rodents, do not vomit. Female house mice have an estrous cycle that is 4–6 days long, with estrus itself lasting less than a day. Following copulation, female mice will normally develop a copulation plug which prevents further copulation. This plug stays in place for some 24 hours. The gestation period is about 19–21 days, and they give birth to a litter of 3–14 young (average 6–8). One female can have up to 10 litters’ per year, so the mice population can increase very quickly. Breeding occurs throughout the year (however, animals living in the wild don't reproduce in the colder months, even though they don't hibernate). Poisoned Bait – At Town and Country Pest Control we place boxes containing the poison externally or internally within the environment where mice activity is found and this is the most effective method to control an infestation. The boxes are secure and able to stop any non-target species (i.e. pets) from eating the poison. 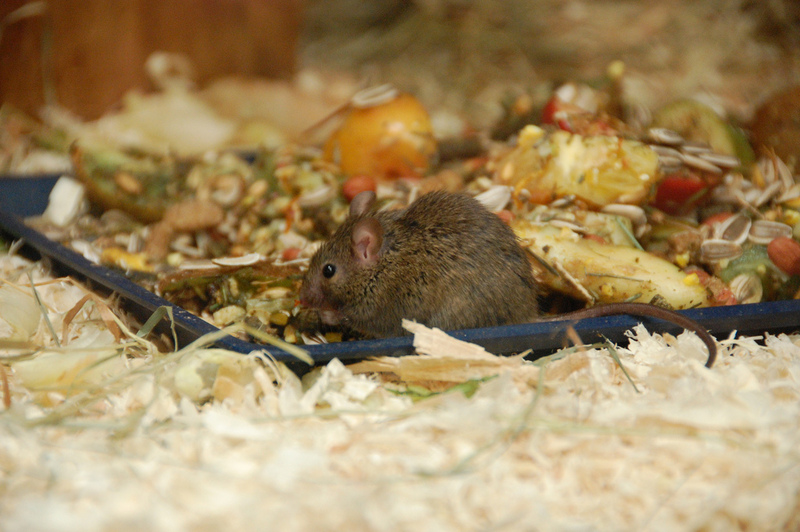 Mice are very investigative and an infestation can usually be controlled within 7- 10 days. Traps - The live capture mouse traps are a humane way of getting rid of mice and the more traditional wooden mouse traps are easy to set and require bait, such as chocolate spread or peanut butter to attract mice. These traps can be used indoors and outdoors. However these traps can only kill or capture one mouse at a time. Repellers - Ultrasonic repellers emit sound that is uncomfortable for mice but cannot be heard by people. These may help as a deterrent to mice trying to enter a home in the first place, but we do not recommend them for existing infestations as mice can swiftly acclimatize to ultrasound. Any food preparation surfaces that mice may have been in contact with should be washed down with a mild disinfectant. Any contaminated food produce should be thrown away. Mice can also be very destructive to electrical wiring by gnawing on the plastic coating. In extreme cases, this can cause fires or electrical shock to anyone touching the exposed wires. The first line of defence against mice is to proof your home. Mice have soft skeletons and can get through holes the width of a pencil, so it is important to seal any holes to the exterior (for example pipe work for washing machines and dishwashers) and fit bristle strip around doors. All rodents require a harbourage, food and water to survive, without one of these present then the infestation will not thrive and then die off. Therefore it is important not to attract mice with food – where possible, store food in strong plastic or metal containers. Regularly cleaning is essential, behind fridges, under cookers and cupboards.